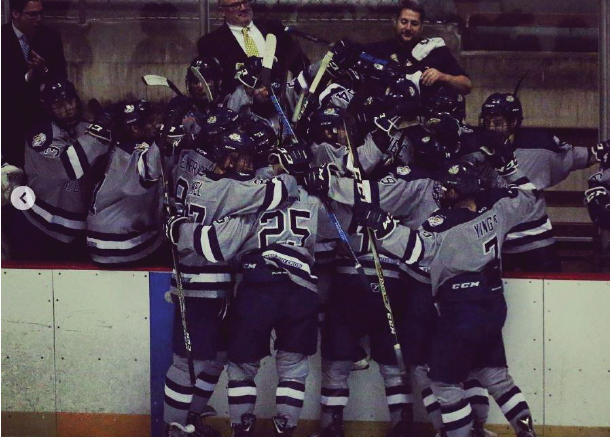 After entering the last week of UCHC regular season play in eighth place, the Lebanon Valley College Men’s Ice Hockey team pulled off an incredible leap to the sixth and final playoff spot thanks to a weekend sweep. Friday saw the Dutchmen hosting the Cougars of Chatham University. The evening also served as LVC’s senior night in which seven players were honored for their contributions to the program. Though the Cougars put up a serviceable comeback effort, the Dutchmen’s offensive firepower proved to be too much as they skated away with an 8-4 victory. The full three conference points helped the Dutchmen’s playoff hopes, but a regulation loss by Neumann University the same evening opened the door for LVC to punch their ticket to the postseason the next evening against rival Stevenson. Saturday’s matchup was set up to be an emotional one as both Stevenson and Lebanon Valley were battling for the last playoff spot in the UCHC. Since the team had only won three games since returning from Christmas break, the Dutchmen entered the game as underdogs, needing all three points to leapfrog Stevenson for sixth place. But the Dutchmen weren’t phased by the noise. It was special teams that proved to be the difference in the contest as Brad Nolan redirected a puck past the Mustangs’ goaltender off a shorthanded shot from T.J. Sneath breaking the 1-1 tie. The Dutchmen finished killing the five-minute major and proceeded to tally on the powerplay, courtesy of Bryan Hovanec. The score remained 3-1 in favor of the Dutchmen until the final minutes of the third frame when the Mustangs pulled within one. However, freshman goaltender Matt Forslund stood tall for the Dutchmen, and another shorthanded goal—this time coming from Cole Hepler on an empty net—sealed the victory, and the playoff bid. Though the victories feel great, the Dutchmen understand the focus needs to be on what’s ahead now more than ever. The Dutchmen will face off against the number three seed Manhattanville College Valiants on Tuesday, Feb. 19, at 7 p.m. in Rye, New York. Follow along or find more information at godutchmen.com.